Dean Del Mastro, the MP for Ontario's Peterborough riding, has quit less than a week after being found guilty of spending too much on his 2008 campaign and trying to cover it up. Del Mastro spoke to MPs in the House of Commons just after question period today. The resignation takes effect immediately. "I will not be a distraction in Peterborough," he said. "I wish it wasn't a distraction. I wish it wasn't something that I had to fight." 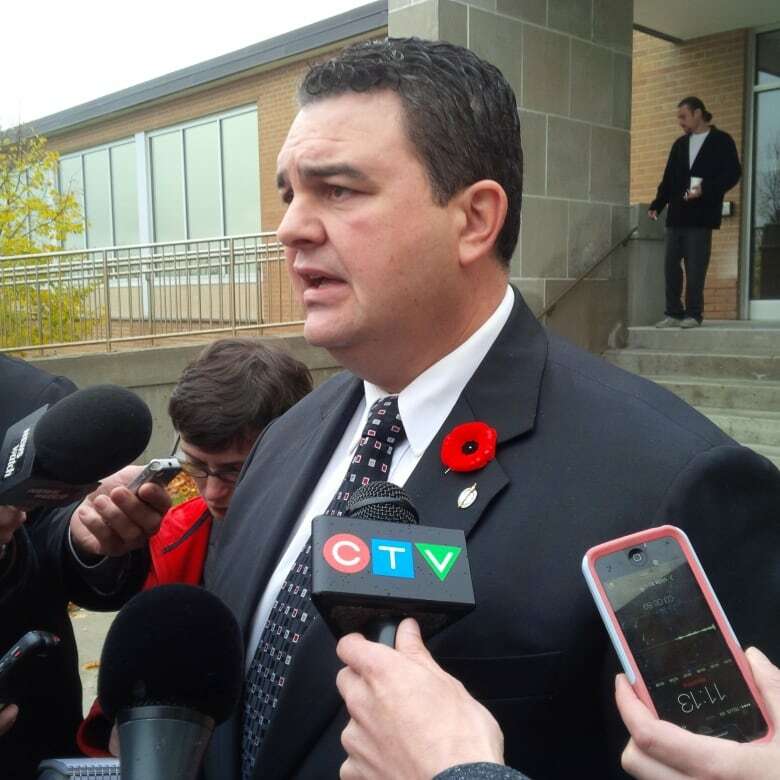 MP Dean Del Mastro, who was elected as a Conservative but stepped down from caucus after he was charged with spending too much on his 2008 campaign and covering it up, speaks to reporters after being found guilty on Oct. 31, 2014. (Laura Payton/CBC)Del Mastro denies having done anything wrong, despite the Ontario Court of Justice finding him guilty. He told the House he would continue to fight. He said Monday that he would appeal to re-open his defence ahead of his sentencing on Nov. 21. MPs were to vote tonight on whether to suspend him from Parliament. One of the penalties for breaking certain laws in the Canada Elections Act, including the offences for which he was found guilty, is a five-year ban on holding a seat in Parliament or running for a seat. The ban takes effect once a conviction is entered into the record, which happens upon sentencing. The Conservatives had suggested having the procedure and House affairs committee look at a number of questions regarding Del Mastro, including whether he should be suspended or expelled and what would happen to his staff and travel budget. But Government House Leader Peter Van Loan said yesterday that they would vote in favour of an NDP motion to suspend Del Mastro immediately. The news came shortly after the head of the Peterborough Conservative riding association told CBC News that Del Mastro's legal fees were paid in part through a Brian Mulroney-headlined fundraiser it held in 2013. ​Alan Wilson, the president of the Peterborough Conservative Electoral District Association (EDA), says the $39,310 fundraiser held at Toronto's swanky Albany Club went directly to Del Mastro's defence. A smaller amount went to Del Mastro's 2008 official agent, Richard McCarthy, who was charged along with Del Mastro and found guilty. "The EDA has paid for a portion of Mr. McCarthy's [legal fees], as much as we were able," Wilson said. 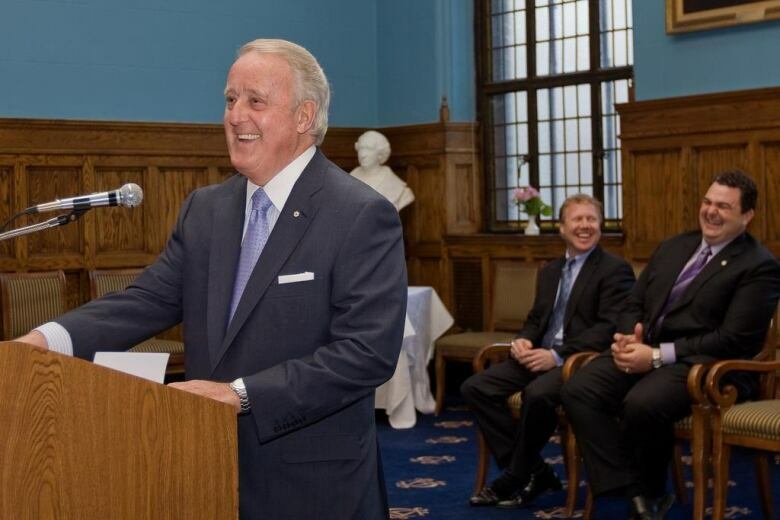 Former prime minister Brian Mulroney, left, headlined a $39,000 fundraiser for Peterborough MP Dean Del Mastro, far right, on May 2, 2013. The head of the Conservative electoral district association in Peterborough told CBC News that the event was held to pay Del Mastro's legal fees. (Facebook)Wilson said the riding association itself didn't pay for Del Mastro's fees, arguing the money from the fundraiser wasn't "EDA funds." "These were funds that were raised separately and essentially moved through the EDA. They were put into the EDA and moved straight back out again. So we did not provide any of our funds for Mr. Del Mastro's defence," Wilson said. In resigning his seat, Del Mastro hangs onto his MP pension, for which he's eligible when he turns 55. Del Mastro, who is 44, was first elected in January 2006. MPs have to serve for at least six years to be eligible to collect a pension. One of the matters that would have been debated at committee, had the Conservative motion gone ahead, was Del Mastro's pension and what would happen to it. Del Mastro signalled in the House Wednesday that he'll continue to fight the verdict. "I've got a big heart but nobody should ever confuse that with any willingness on my part to ever back down. I did not donate too much money to myself. I did not and I stand by my filings in 2008," Del Mastro said. Del Mastro addressed some of his comments to Conservative Party MPs, the party of which he was a part before he was charged in 2013. "I told you that I would not put you in a position where you had to vote against me," he said. "Stay united. I will not divide you. I will not be the one that divides you. I believe too much in what you do." The party has been eager to distance itself from him since the guilty verdict, though individual Conservative MPs continue to support Del Mastro. The Conservative caucus stood and applauded Del Mastro following his speech. A senior party source, however, told CBC News Wednesday that Del Mastro would not be allowed to run for them.